It's 1943, and nearly-12-year-old George and his older brother Jack are spending a restless wartime summer in Whitby, Ontario, where their mom is working at a munitions plant while their dad is off fighting the Germans. One afternoon, the boys stumble across Canada's top-secret spy camp-and so begins an exciting and terrifying adventure as George and Jack get caught up in the covert activities of Camp X. Fascinated by Camp X and its secrets, the boys begin to suspect local townspeople of being spies. Is the police chief keeping tabs on people for enemy purposes? Is Jack's boss at the newspaper really amassing information for sinister reasons? Unable to resist the camp's allure, the boys keep going back to find out more details of what's going on-they even meet William Stephenson, the Man Called Intrepid himself. They also attract the attention of a very sinister character, someone who is determined to use George and Jack's knowledge against the Allies, no matter the consequences . . . or the casualties. 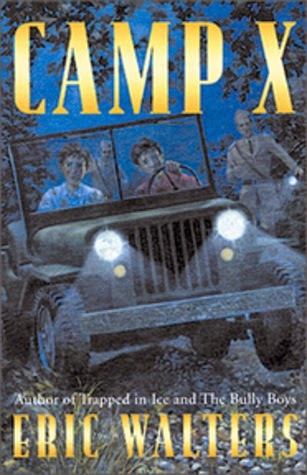 Camp X is a book set in the time of 1942 during the Second World War. It is told from the perspective of twelve year old George Braun. His father enlisted in the army so he lives with his older brother Jack and his mother. Their mother works at the ammunitions plant, and one day the two boys were play-fighting when they stumbled upon a top secret spy camp called Camp X... and were told to never go there again. Eventually, curiosity takes over, and hey return to Camp X multiple times. But, they think its a camp training Nazis, not Canadians! I like this book because Jack and George make mistakes along the way. I also enjoyed this boo because it taught a lesson about loyalty to your country, especially in a time of such chaos. How fun! I remember reading little gems like this when I was in grade school. I was all about Hardy Boys, Nancy Drew, Boxcar Children, and Holes. Anything that had a bit of adventure or mystery totally me, but I also loved WWII era stuff as a kid as well. I remember reading the diary books set in this time period! Such fun! Thanks for sharing your thoughts on this book!! The combination of espionage, mystery, and suspense might be enough to hook some readers. Younger me probably would have found the book hard to put down. WWII era stuff is particularly intriguing. I remember liking this book as a child, and the mystery aspect was what hooked me. I loved WW2. This book looks interesting! It's something I would have picked up back when I loved middle grade.